Product information "Sensor Temperature for deep-freeze warehouse"
The manufacturer Didactum is expanding the portfolio of network-enabled sensors. So this new temperature sensor is specifically designed for precise temperature monitoring in deep-freeze warehouses. This temperature sensor can measure from minus 40 degrees to plus 100 degrees Celsius. It is manufactured by Didactum in EU. The integrated sensor unit is potted in epoxy resin. The micro chip of this deep freeze temperature sensor is calibrated permanently. The accuracy of this sensor is ± 0.3 degrees Celsius. With support of a calibrated thermometer, you can later re-calibrate this deep-freeze temperature sensor in the WebGUI of Didactum`s remote measurement device. 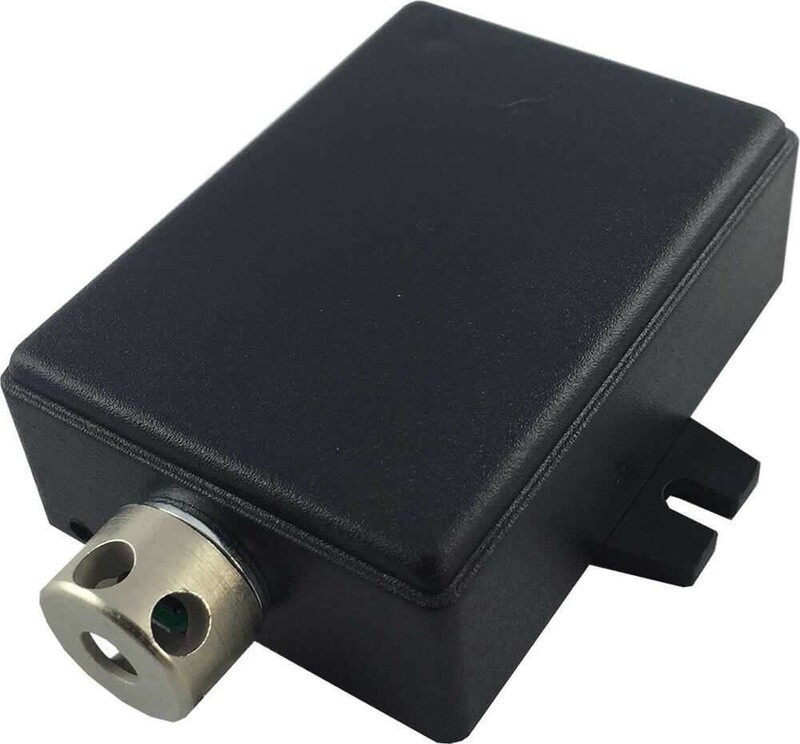 This digital sensor is compatible to Didactum IP-based monitoring systems 400/500 / 500 DC / 600 and it is easy plugged in to one of the two CAN bus ports (Control Area Network). Up to 30 pieces of these deep-freeze temperature sensors can be connected in series via RJ12 patch cable to a CAN bus port. Since the IP-based Didactum measurement and monitoring systems 400/500 / 500DC / 600 are equipped with 2 CANbus ports, so in total up to 60 pieces of deep-freeze temp sensors can be monitored from a single remote measurement system from EU manufacturer Didactum. The total length of each CAN bus cable can be up to 220 meters (approx. 721 ft), so that even a large deep-freeze food logistics infrastructure can be reliable temperature (remote) monitored. The temperature sensor for deep freeze warehouse is automatically detected by Didactum`s monitoring system and listed in it`s multilingual webGUI. The measured temperature data is stored in the integrated data logger of Didactum`s network enabled remote measuring and monitoring system. By inserting an SD card, the built-in data logger of Didactum`s monitoring systems 400/ 500/500 DC/600 can be extended up to 64 gigabytes, so that over a long period, captured in real-time temperature data is stored. If desired, you can display graphically the diagrams directly in the multilingual web interface. Here you can check whether the required deep freeze storage complies with legal requirements. For proof and audits, the temperature reports can be exported in the form of XML or CSV files and further processed with common applications, such as MS-Excel. Didactum`s monitoring systems are fully SNMPv1, SNMPv2c and SNMPv3 compatible, so captured in real-time measurement data can also be transferred to data visualization tools like RRDtool or CACTI. The data export can also be done on SNMP compatible automation or building monitoring software. Using SNMP commands, the connected deep freeze temp sensor can be queried via TCP/IP network or the Internet. If temperature specifications in deep freeze logistics infrastructure are exceeded or fallen short, so you and your colleagues will be informed from Didactum remote monitoring system via email, SMS (via GSM modem), alarm siren or SNMP traps. External technicians can be also integrated into the emergency response plan of deep-freeze logistics center. All events and state changes are stored in the syslog database including date and time. The Syslog can be sent at intervals to the headquarters and evaluated from there. The Didactum monitoring systems 500 and 500 DC have 4 integrated relays, enabling more interesting applications. Related links to "Sensor Temperature for deep-freeze warehouse"
Scope of supply: deep-freeze temperature sensor, suitable for Didactum monitoring systems 400/500/500DC/600, including 2m RJ12 patch cable and mounting hardware (screws). Customer evaluation for "Sensor Temperature for deep-freeze warehouse"